This is another fill-in/inventory issue. 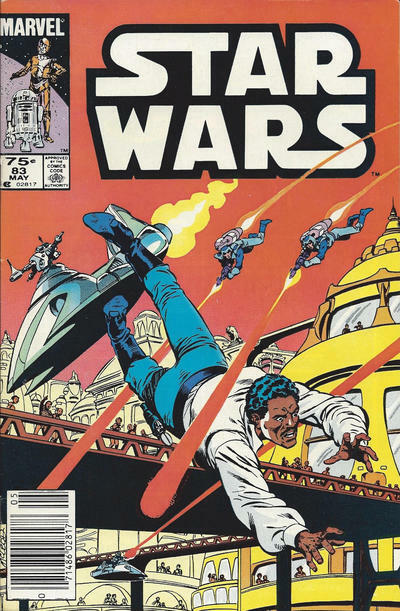 It is written by Linda Grant, a Marvel editor at the time with a few freelance writing credits to her resume (including a run on Marvel's Indiana Jones series, also licensed from LucasFilm, that begins a few months after this issue was published), making her the second woman (after Jo Duffy) to fully write an issue of this series, a distinction not shared by very many other titles (for example, up until late 2018, Uncanny X-Men had never had a woman write an entire issue, and even then, Kelly Thompson is co-writing along with two other (male) writers). Bob McLeod, fresh off his run on New Mutants (at least based on when this was published) pencils, inks and letters the issue. Though they won't all be fill-in issues like this, the series won't catch back up with Luke, Plif, Kiro and the Rik Duel gang until issue #87. 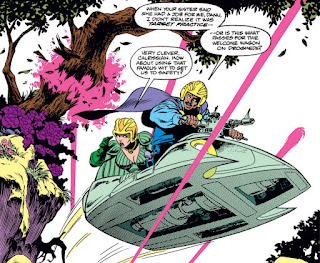 Lando says he was looking for an excuse to get off Arbra, but last we saw, the former Rebels were still operating out of Endor. Yet we know this also takes places after Jedi, as the fall of the Empire is referenced. 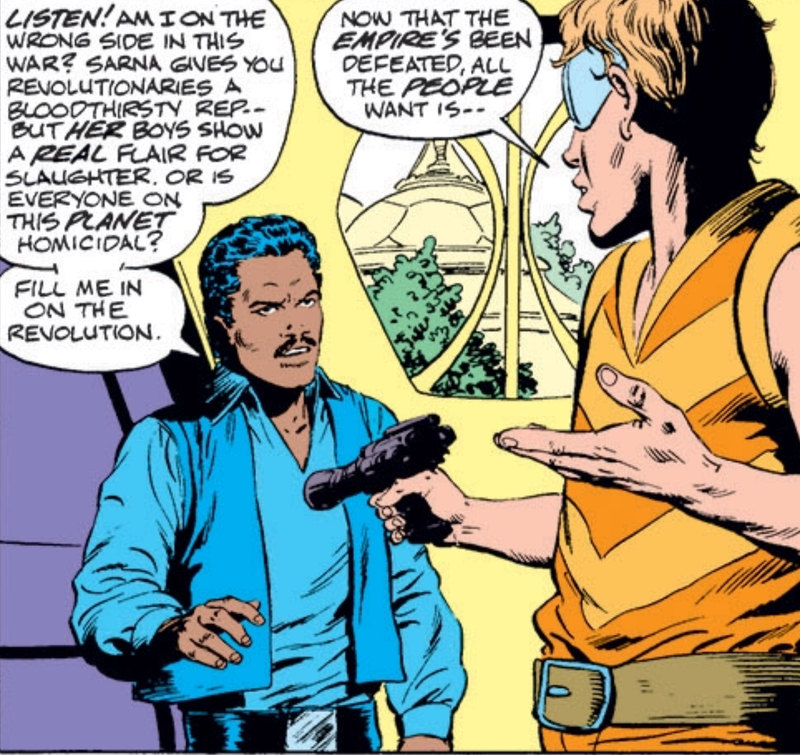 Apparently, the concept of a Welcome Wagon exists in the Star Wars galaxy. This series has a fairly successful history with fill-in issues (Jo Duffy herself wrote a few becoming the series' regular writer), and this one certainly fits the mold of the previous ones, melding some fairly generic sci-fi elements with one or more Star Wars characters. 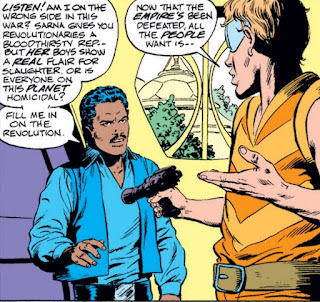 Here, Lando gets the spotlight, with the added detail that the villain is a former flame fitting his role as the more debonair of the series' heroic scoundrels. That said, it's a shame the book had to fall back on a fill-in at this point, just two issues into its post-Return of the Jedi narrative (and with only one of those issues even partially about exploring the ramifications of the Rebellion's ultimate victory in the film). So just as that story is starting to build, complete with the return of a handful of the series' recurring non-film characters, it's pushed aside in favor of this. Which is perfectly fine for what is is, but nevertheless robs the series of the narrative momentum it was just starting to build. Han gets into the diplomat business! I’d read a couple of obscure Golden Age Flash Gordon knockoffs just before this and it had a pleasantly similar feel.